Micromax is an Indian mobile phone producer which has presented many attractive handsets to the users which have become very popular all over the world and especially in India. Micromax has recently released one of their dual SIM mobile handset which is called Micromax X370. This mobile handset is a nice one and enriched with various attractive features. The price of this new handset is still unknown. 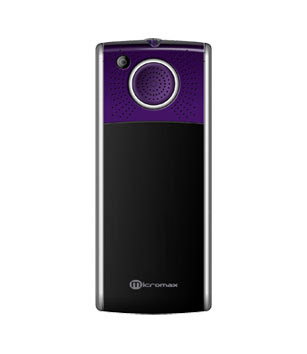 The Micromax X370 can operate at frequencies of GSM 900 / 1800 MHz for SIM 1 and GSM 900 / 1800 MHz for SIM 2. This is a bar shaped phone which has got a nice look. The dimensions of the phone are 113 x 47 x 10.9 mm and the weight of the phone is only 70 grams. This phone has a 5.6 cm wide TFT display which supports 65k colors. The display screen is very clear and offers a clean view. The phone has a 2 MP digital camera which supports digital zoom. The camera of this phone is a good one and gives you a high quality image with a maximum resolution of 1600 x 1200 pixels. It also has video recording capability. The Micromax X370 offers a bundle of wireless technologies. It has Bluetooth v2.0 and GPRS connectivity options for wireless data transfer. The phone has Opera Mini web browser for better internet surfing experience. It comes with a 3.5mm Audio Jack. The Micromax X370 is a good phone for multimedia and entertainment. This phone is loaded with a media player which can play audio and video files with different extensions such as MP3, MID, AMR, WAV, AAC, WMA, MP4, 3GP etc. It also has a Stereo FM Radio with recording. It supports MP3 and polyphonic ring tones. It has an internal memory of 3.9 MB and supports MicroSD memory card which is expandable up to 8 GB. The phone is powered with a powerful Li-ion 1000 mAh battery which provides a long talk time and stand by time. The Micromax X370 is now available in the market with only two colors: black and blue. The Micromax Company is always good at feeling the need of the users. So the mobile phone company has achieved a huge success in a very short time. The new Micromax X370 is their latest gift. The phone is as always with a nice shape. Though the price is not still known to us, it is believed that it will be within affordable price for the Indians.